Devonshire ancestors just got easier to uncover with the release of over 4 million parish records this week. findmypast have worked in partnership with Devon Heritage Services to scan and transcribe the original parish registers held by both the Devon Record Office in Exeter and the North Devon Record Office in Barnstaple. 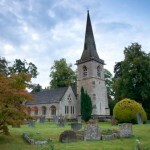 Baptisms, marriages, banns and burial records are included for the vast majority of Anglican parishes in the area and include notable Devonshire folk such as Charles Babbage, Samuel Taylor Coleridge and Agatha Christie. The new data set is now available to search on the findmypast website and offers full colour scans of the original records covering the period 1538 – 1915. The remaining areas of Devon are covered by the Plymouth and West Devon Record Office whose records are already available to search on the site. With the addition of this latest release findmypast can now boast the biggest collection of parish records for the county and are a go-to resource for anyone with ancestors in the area.